17th April 2018: Cumbrian property company, BEC, has revealed more detailed information about its proposed scheme at North Shore, Whitehaven. The sche me, being developed with partners including Whitehaven Harbour Commissioners and Copeland Borough Council, proposes a 4* hotel, 400 space multi-story parking and a five-story office development. A further development will see a mixed-use office and eatery geared towards start-ups and innovators. All work will be supported by improvements to the road infrastructure, led by Cumbria County Council. The 4* hotel will feature five storeys, c.100 rooms and will help realise the long held local ambitions for increased tourism on the Cumbrian coast. It will also be a leading social spot in Whitehaven, bringing forward a new place for post work and weekend drinks in the “sky bay” overlooking the harbour. 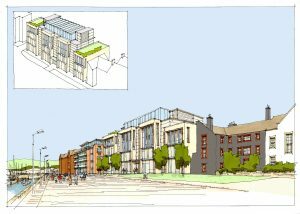 The former Mark House site will be home to a five storey, 75,000 sq. ft. office development with ground floor mixed use space – delivering more footfall to the harbour area and town centre. The site will help retain and attract high-skilled public services together with private sector nuclear and advanced manufacturing supply chain employment for the area. Whitehaven’s parking woes have long been debated by officials and public alike. 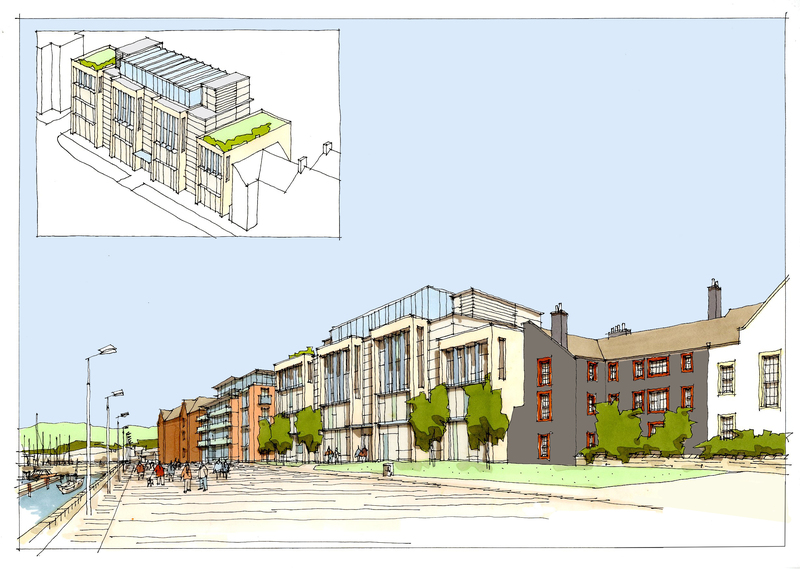 BEC proposes to both cater for the development and help alleviate existing parking issues with an affordable multi-storey car park on land to the west of North Shore Road, adjacent to Tesco. The parking provision is being designed to come forward in stages, growing with the scheme. Rather than the traditional parking infrastructure, BEC intends to integrate ‘living walls’ into the structure to improve the schemes overall carbon footprint and visual appeal. BEC is also working in partnership with Cumbria County Council to deliver a highway solution which will not only underpin and service the North Shore scheme but deliver a significant upgrade to the main entrance to Whitehaven town centre from the northern access. 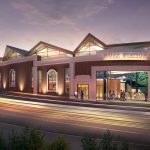 A further development on the old bus station site will see a new hub with flexible office and meeting space that supports start-ups and innovators combined with a wholesome, artisan eatery that is open to the public. Detailed information on this development will be released shortly. These developments make up phase one of North Shore plans and make up a £55m investment (approx.). The scheme has the potential to be part of improvements to the town, during a second phase, worth £300m. BEC will be keeping all stakeholders up to date about future plans. The scheme ties in with BEC’s golden thread of low carbon activity and the highest achievable BREEAM (Building Research Establishment Environmental Assessment Method) rating will be targeted for all buildings that BEC develop. The company is also exploring potential for a ‘net zero carbon’ development, opportunities for energy generation, storage and distribution together with plans that minimise energy import from the gas and power grids while maximising on-site generation using low carbon energy sources. Initiatives such as the living walls of the car park will also support these aims. In person: A dedicated consultation cabin will be in place on the old depot site before the end of this month. Open 2 half days a week the cabin will serve as a drop-in base for anyone to learn more about this scheme. At events: BEC will speak at a series of events, including the BEC Business Cluster in May at Energus and will also hold their own events looking at different elements of the scheme. The first will be on the 24th April at The Beacon Portal at 10am. Anyone who wishes to attend can register here https://www.eventbrite.co.uk/e/bec-north-shore-scheme-event-1-scheme-launch-tickets-45055088984 or email events@BECnorthshore.com for more information. Mike Starkie, Mayor of Copeland, concluded: “I believe the plans for the North Shore area of Whitehaven will be transformational for the town. They tick every box. The high-quality hotel ties in with our ambitions to increase tourism and give people working in and around Whitehaven another option to stay in town, rather than staying elsewhere and travelling in. “The office development will attract employment and business to the area, in addition to increased footfall courtesy of the recreational use on the ground floor, while the multi-storey will help solve long-standing parking issues in the town. For many years, Mark House stood derelict and represented an area’s decline. But I believe its demolition and the exciting new plans that we now see coming forward truly signify our town’s renaissance.